The management of the Accra Mall is optimistic that the retail centre will resume full operations by Saturday, October 13, 2018 following the ceiling collapse that injured three shoppers on Thursday. It also affirmed its commitment to ensuring the safety of its customers in a statement released on Thursday. “Mall Management says it is hopeful that the entire mall will be operational by Saturday 13th October 2018”. The statement reiterated that, the facility’s benchmark for customer and public safety remains paramount and it would adopt every necessary step to safeguard these standards. Although the National Disaster Management Organisation (NADMO) and the police have cordoned off the affected area following a preliminary assessment of the damage, the management of the mall says the other shops remain open for business. The statement, signed by its Marketing Manager, Denise Asare, said the Accra Mall was conducting an independent probe to determine the cause of the collapse and will duly inform the public of its findings. NADMO had earlier confirmed that three persons were injured after portions of the ceiling of the shopping centre’s electronics hub collapsed. Speaking to Citi News, the Director of Geological Disasters at NADMO, Richard Amo Yartey, explained that, the three, all Nigerian nationals, were receiving treatment at the Mall clinic. Mr. Amo Yartey added that, NADMO is conducting an assessment of the damage caused by the collapse while the area has been cordoned off. President Nana Akufo-Addo tweeted soon after the incident, expressing his sympathies to victims of the accident at the Accra Mall. 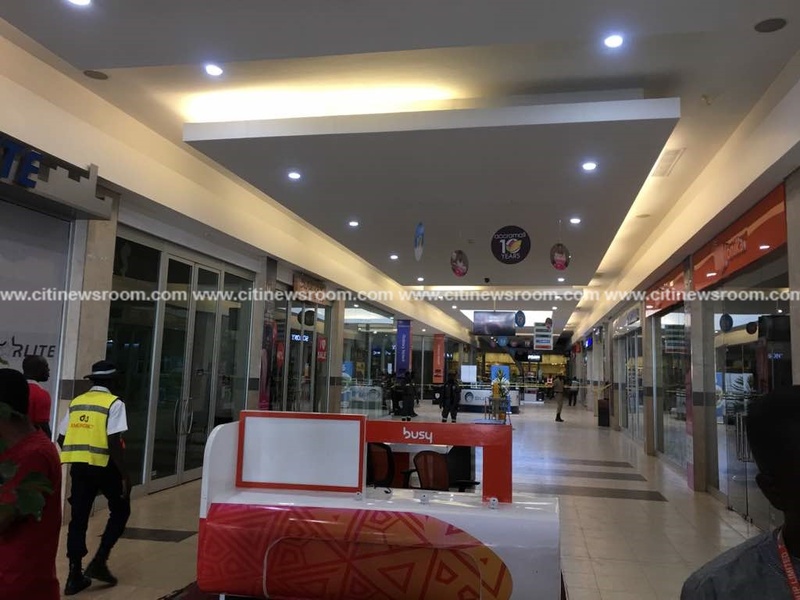 The Management of Accra Mall today confirmed that a part of the ceiling in the Mall Square area collapsed this (Thursday) morning, resulting in the temporary closure of that section of the Mall. Three persons, all them shoppers, were reported to have sustained minor injuries during the incident and have received medical treatment. All other sections of the shopping centre, such as the Food Court and all the shops on the Shoprite wing of the mall are now operational. Mall authorities disclosed that an investigation has been ordered into the cause of the incident and that the public will be duly informed of the findings at the end of the investigation. The incident occurred at about 11:53 am and all necessary contingency measures were taken to ensure customer and public safety, as a full technical team comprising Engineers, Architects, NADMO Operatives and officers of the Ghana Police Service have been working assiduously on site to clear up the affected section for public use as soon as possible. Mall Management says it is hopeful that the entire mall will be operational by Saturday 13 October 2018 but reiterated that the facility’s benchmark for customer and public safety remains paramount and it would adopt every necessary step to safeguard these standards.